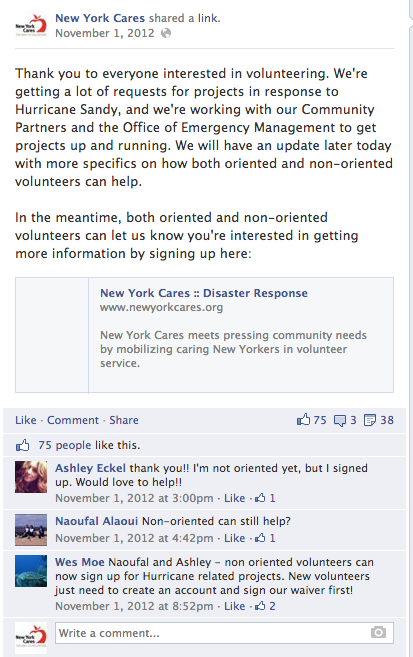 People had many questions about volunteering after the storm, and one of the best ways to address them was on social media. 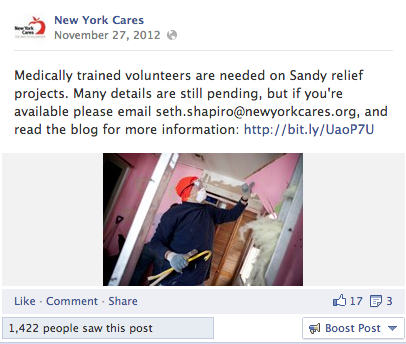 After Hurricane Sandy, the fastest way to reach volunteers was through social media. 20 minutes after posting this to our Facebook page, the project was filled. 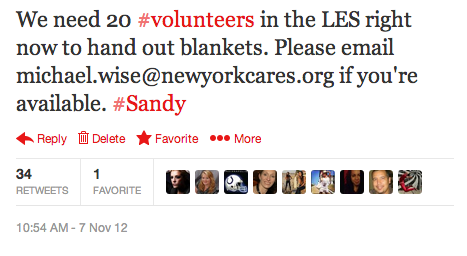 This plea for volunteers was Retweeted many times, and we got the project filled in 15 minutes. We needed many specific kinds of volunteers during the disaster, and with people sharing our updates we reached a wider audience to get people with certain skills. Our efforts after the storm got national attention. 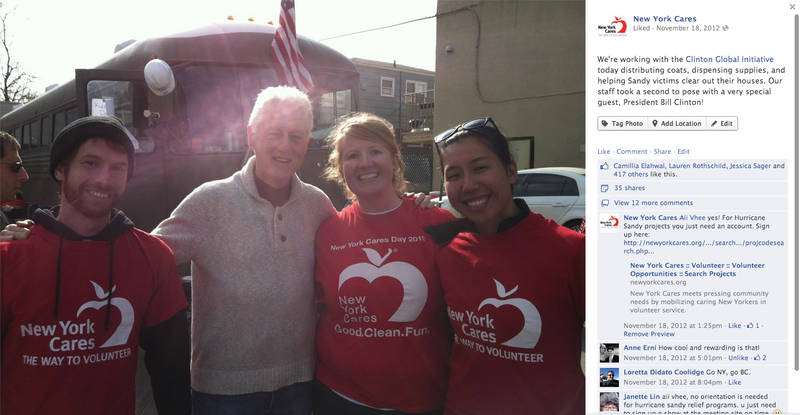 The Clinton Global Initiative came out one day to help in the recovery and meet our staff. 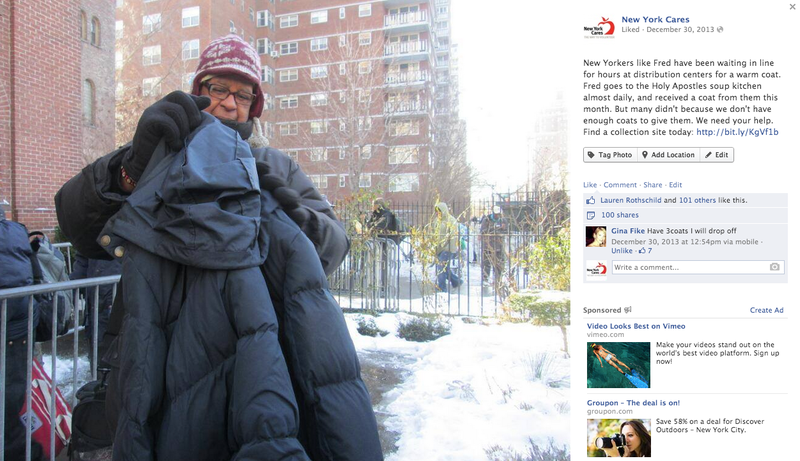 In 2013, our annual Coat Drive needed help. Despite a cold winter and more agencies requesting coats than ever, our donations were way down. We went on a media blitz to get the word out. The donation numbers are still coming in, so it remains to be seen the effect the overwhelming press had on donations. Personal stories of people who need coats always perform well, and put a face to the need. 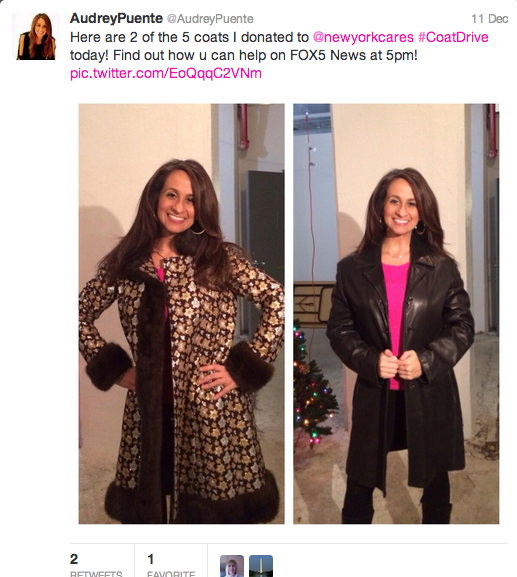 Audrey Puente of Fox 5 covered the Coat Drive’s increased demand for coats and even shared her own donation on Twitter. New York Governor Andrew Cuomo eventually released a press release about New York Cares’ desperate need for coats, and shared with his Twitter followers. This entry was posted in New York Cares and tagged bill clinton, blog, coat drive, disaster response, facebook, hurricane sandy, new york cares, social media, twitter. Bookmark the permalink.